View Form appears when a user views a single record. Edit Form appears when a user edits an existing record. Add Form appears when a user creates a new record and features blank fields, which a user can fill out. In addition to these built-in forms, you may want to create a custom form that has exactly the fields you want, in the order you prefer. You may also want a different form for managers and employees. Form content also might depend upon the choices that a viewer's already made in one field. For example, if an employee chooses "Sales" as their department, you want Quick Base to automatically display the Commission field and automatically populate the Supervisor field with the name of the sales manager. Tip: If users will be accessing the application on mobile devices, such as smart phones or tablets, read tips for making mobile-friendly forms. You can create as many custom forms as you want for each table in your app, unless your account is on the Quick Base Essential plan, which only allows one form per table. Create a different form for viewing, adding or editing a record, as well as one for each saved report in your application and/or each role, if you want. Specify which fields appear in your form and where. Select only the fields you want and set their order. Make some fields required. There may be times when you want a field to be required on one specific form only. For example, supervisors approving a reimbursement request may need to enter their Department number for budgeting purposes. Add formatting elements. Add tabs, section headings, horizontal rules, explanatory text, and HTML tags to link to other pages. Embed reports from related tables. When you display a project record, wouldn't it be nice to see all the tasks related to that project? You can embed a table of related tasks on a form. You can even set parameters for which detail records display. Show only open tasks. Or display only those tasks belonging to the current user. Set dynamic form rules. When you create dynamic form rules, your form can react to user input. For example, when a user selects a checkbox called Completed, Quick Base canautomatically fill out the Date Completed field with today's date. 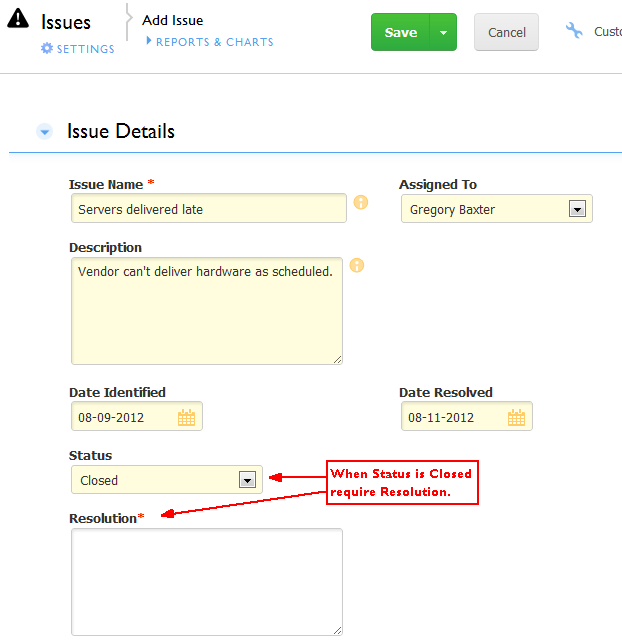 Or, when a user changes the issue's status to closed have Quick Base require the field called Resolution (see image below). Show live dynamic Formula and Lookup fields. The value that a formula field displays is based on the values in other fields in the record. Only after a user enters values in each field that the formula references, can a formula field calculate its own value. For example, if you have a formula field which calculates a Finish Date based upon what a user enters in the Start Date and Duration fields. Once a user enters a value in both fields then tabs away or clicks in another field, Quick Base displays the resulting value in the Finish Date field. If you're editing an existing record, Quick Base lets you know that the formula field is recalculating by displaying a temporary strikethrough of the value (which looks like this) before the field shows the updated value. When you fill out a dynamic form, fields you complete or click away from appear in yellow (see the image below). This indicates that the field contains a different value than it did when you opened the form (change it back and the color disappears). As a result of an edit—and depending on what rules apply to the form—additional fields may display or be completed automatically by Quick Base. If a rule decrees, messages may also appear, either when you enter certain information, or if you try to save without completing a field that the rule requires. it's required. This asterisk appears only after you select Closed from the Status dropdown.